Kate Gosselin Dons a Linda Masquefa bag for the DWTS Finale! ABC's Dancing With the Stars contestant and reality TV personality Kate Gosselin selected to wear a bag by EKC luxury handbag designer Linda Masquefa! NEW YORK – MAY 26, 2010 – Troy Osinoff, the 21-year-old founder of MakeADare.com, a new online social networking site for thrill seekers, is scheduled to appear on “Dr. Phil” tomorrow to discuss the recent surge of internet-based communities for amateur stuntsmen. In the segment entitled, “Extreme Teen Dangers,” Osinoff will share his insider perspective on this controversial trend, which he believes has allowed regular people everywhere to liberate themselves from the rigid rules of society in the name of having a little fun. The show will explore the psychological motivations behind teens’ association with “Jackass”- style dare communities and will profile several young adrenaline junkies who say they are proud of their seemingly reckless behavior, which has occasionally resulted in critical injury. Meanwhile, Dr. Travis Stork, host of “The Doctors” and author of the new book, “The Doctor Is In,” will share real-life emergency room stories about the gruesome aftermath of teens attempting such daring feats. Social networking site MakeADare.com was created with the goal of providing a virtual home for amateur pranksters that would provide them with the optimal opportunity for recognition. Often described as “YouTube meets ‘Jackass,’” MakeADare allows members to create and share stunt videos, dare others and vote for the best dares. Users award each other “streetcred,” a voting-based system of points that can be redeemed for prizes dedicated to the continuing pursuit of dare-filming, such as video cameras, multi-media equipment and editing software. Today, MakeADare has emerged as the premiere centralized platform for an ever-growing, worldwide population of dare enthusiasts. Equipped with full interactivity and prizes, MakeADare provides this unique community with unprecedented global access to competition, camaraderie and exposure. Internationally known for his straight-talking, “get real” philosophy, author and distinguished psychologist Dr. Phil McGraw hosts a syndicated, daily one-hour series that is the second highest-rated daytime talk show in the nation. During its eight seasons on the air, “Dr. Phil” has explored such issues as addiction, domestic violence and racism, while galvanizing millions of people to create more positive lives for themselves. The Guys of Softline Talk Recession-Busting on Fox News! EKC has just signed on to represent Swell Skin, an all-natural skincare line by Ohio mom of three, Kelli Klus! 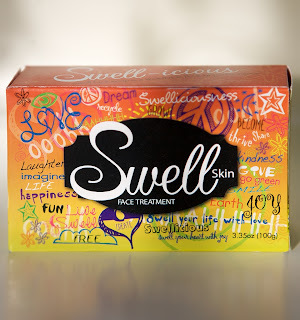 Kelli came up with the idea for Swell Skin when she started to feel overwhelmed by all the pricey, complicated skin regimens that were constantly being pushed on her at department stores. 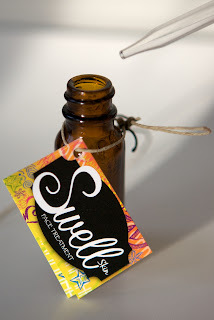 She decided to create a line of products that were simple, inexpensive and actually did what they promised. Kelli Klus had never had "good" skin. Plagued by rashes and acne well into her adult years, she sought out doctor after doctor and bought expensive cream after expensive cream. "A doctor would just look at me for 40 seconds, then hand me a prescription," she said during a recent interview. "It was so frustrating. Not to mention expensive." 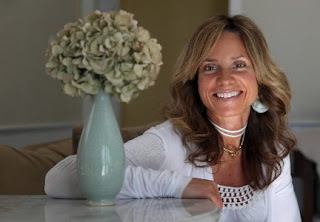 As a homeopath, Klus was already well-versed in holistic remedies and decided to research her skin issues. Her findings led to the launch of her own line of products, called Swell Skin. Can't wait to see the results for ourselves, and to start spreading the word about these fabulous products! I would like to extend a very special goodbye to my mentor and longtime friend, Kim Lee. 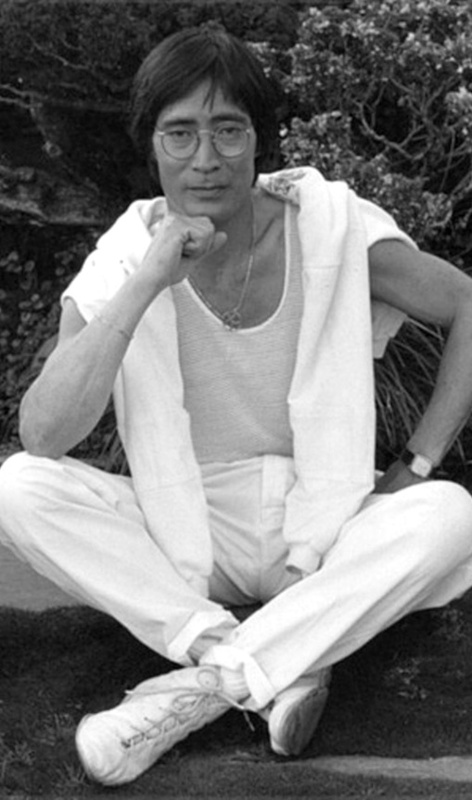 I was a professional dancer in my early years, and Kim played a major role in the development of my career by fine-tuning my body through pilates. As a struggling young entertainer who was barely able to pay rent, I didn't think I could afford to take classes at the prestigious workspace that Kim had created for himself, where he frequently taught all the major A-list stars of the time. However, Kim was kind and generous enough to not only reduce his fee so that I could attend class, but to be sure that he spent as much time with me as he did with the likes of Steven Speilberg. Sadly, I lost contact with Kim over the years, but he has remained in my heart. Having learned of his passing, I am now heartsick that we didn’t see each other face to face. I genuinely respected and admired Kim, and even now when I think of him I am taken back to the days of being a young girl and feeling so honored and humbled to be in the presence of such a great teacher and human being. He made me a stronger person in more ways than one, and I will be forever grateful. My sincere condolences to Kim's family during this devastating time. Kim Lee's memorial will take place this Sunday at noon at the Los Angeles Friendship Center, 5899 Venice Blvd. Los Angeles, 90019. Happy Birthday to Amanda Eliasch! 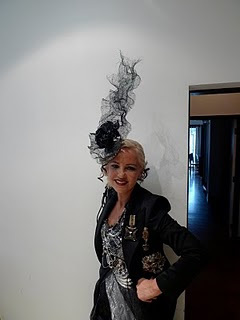 Eileen Koch & Company would like to extend our warmest birthday wishes to long-time friend and client Amanda Eliasch! The jet-setting socialite, photographer and fashion editor threw a massive bash at her London home last night, where some of England's most glamourous and interesting people turned out to join her in celebrating. The butterfly-themed fete featured a film about Amanda's life, created by her friends, including renowned artist Tracy Emin. Check out Amanda's blog for photos of the party. Happy birthday from EKC, Amanda! May you have many more fabulous years to come! TCC: You are busy with a lot of different projects. What are you loving the most? LB: Just to be able to do what you love is really amazing. I'm getting to host a show, singing, doing some acting, kind of all of the above. Everything is really a lot of fun, I love being busy. That's something my parents always said, "You know how to manage your time." People ask if I take a vacation and when you love what you do, everything is a vacation. I’m just loving it all, to tell you the truth. TCC: You’ve been working on a second album as well. What can we expect from your sophomore album? LB: It's got a new sound. It's got country in there, but it’s got some pop, rock, R&B, and I love all different styles of music so I kind of make my own genre. It’s going to have a lot of different flavors in it and I’m just showing that I’m growing. I’m being an artist and getting out there and figuring out Laura Bryna and trying to be me! TCC: I am very excited to hear your new album. Do you know when it will be released? LB: We’re on the second and third song right now so we are thinking probably around August or September, but like they say in construction, they give you a date but it’s not for two more months down the road. But there is no hurry, we want to make it right. TCC: Exactly! You want to make it feel right and personal. How do you think the events in your life have shaped your new album? EKC's favorite bad boy, Josh Hansen, swapped his racing gear for clean-cut duds last night for the premiere of the new Amanda Seyfried movie, "Letters to Juliet." Josh walked the red carpet at Grauman's Chinese Theatre with his friend, "The Hills" star Stephanie Pratt. Stephanie looks lovely as usual, and does Josh clean up nicely, or what? We hope they had fun! Genlux readers: check out Linda Masquefa's stunning creations in the Spring II issue, hand-picked by international socialite and discriminating fashion editor Amanda Eliasch for her 'Editor's Picks' page. As her must-haves, Amanda chose two of LM's opulent, classic evening bags-- a black one and a metallic one, both made of died python skin with gold accents. We could definitely see either one of these on her fabulous arm! Josh Hansen Does It Again! 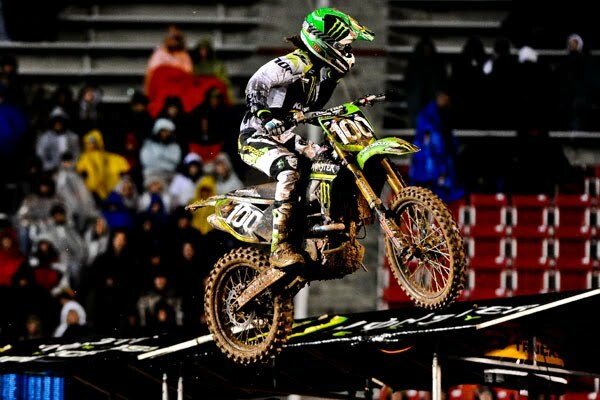 Sure enough, Josh ended the Supercross season with a bang, coming in second at the Las Vegas East-West Shootout this weekend! 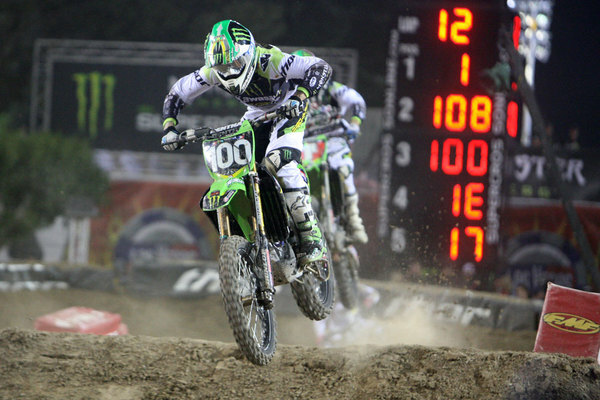 First place went to Josh's friend and teammate, and 2010 champion, Jake Weimer. Congrats to Josh and Jake-- an awesome ending to an amazing season! 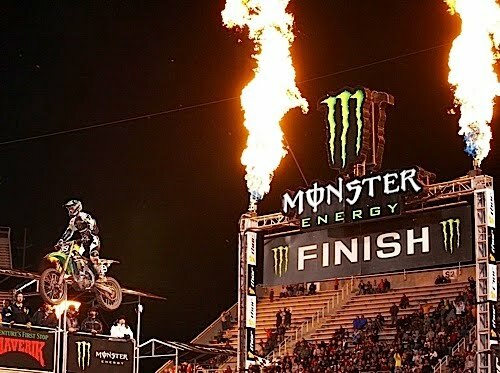 Now, it's all about prepping for the X-Games in July...can't wait! EKC sends our best to Josh Hansen, as he preps to compete in his final Supercross race of the season tomorrow in Las Vegas! Josh has had an awesome comeback season, wowing everyone with a last-minute win at last week's race in Salt Lake City-- in crazy weather conditions, no less! With the West Region races officially over, tomorrow is all about bragging rights, and we have a feeling they'll go to Josh. Knock 'em dead tomorrow, Josh!! Eileen Koch & Co. is pleased to welcome up-and-coming triple threat Amy Molen to our client roster! A passionate performer since childhood, this stunning Southern girl came to LA in hopes of sharing her staggering talents with the world. Amy just signed to top talent agency CESD, and in the next few months, she'll start work on her debut country-pop album, in addition to beginning production on several acting projects. Musically, Amy cites divas like Sheryl Crow, Nora Jones and Chrissie Hynde as her inspirations, while Audrey Hepburn and Angelina Jolie are her silver screen idols. We already adore sweet Amy, and we know Tinseltown will too! 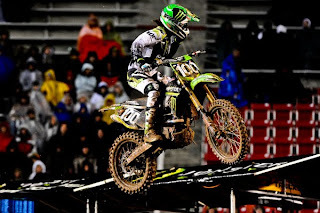 LAS VEGAS– Trailing his recent victory in Salt Lake City and concluding what many have called his comeback season, X Games champion Josh Hansen plans to give his all at the Monster Energy AMA Las Vegas Supercross on Saturday, May 8 at 7 p.m., at Sam Boyd Stadium. Following his 2009 hiatus from racing due to the tragic loss of two close friends, Josh’s January return to the track aroused anticipation among motocross buffs who wondered what the 26-year-old would bring to the Monster Energy Team this season. However, aided by the guidance of Mitch Payton, Hansen re-emerged just as his fans remembered him: a rider with smooth, effortless style, undeniable speed, and a down-to-earth persona that hardly hints at the fact that he’s been making a name for himself in the racing world since high school. 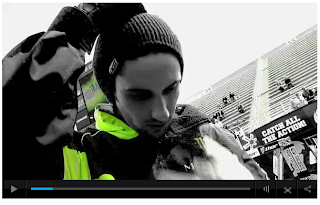 The son of champion rider Donnie Hansen, Josh surprised everyone when he won X Games 14 in 2008 as the underdog. But when he took home the gold again the following year, it became clear that Josh Hansen was a force to be reckoned with. Now, Hansen concludes his comeback AMA Supercross season triumphantly, ending with that elusive win under his belt, along with other top-five finishes. 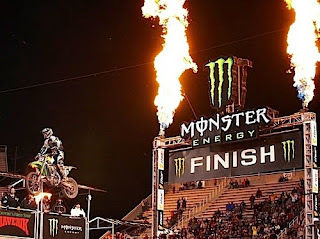 The icing on the cake would be to surprise his fans with a another win at the East/West Shootout – right before taking home his third consecutive X Games medal in August. 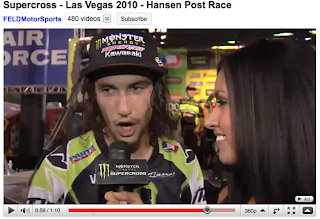 Josh Hansen Wins SLC Supercross!! EKC is thrilled to congratulate client Josh Hansen on his big win over the weekend in Salt Lake City! Known as the bad boy of motocross, Josh gave this season his all, showing off his smooth style and incredible speed to the dedicated fans who had missed him last year when he took time off from racing. He's earned several top-five finishes this season, but had yet to take the podium....until now! 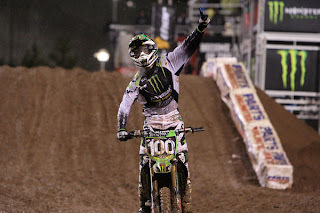 On Saturday in Salt Lake City, when insane weather conditions had the other racers taking a conservative approach, Josh fearlessly hit the dirt to claim that trophy he'd waited for all season. We knew he could do it!! Congrats, Josh, and best of luck at the East/West shootout in Vegas this weekend! 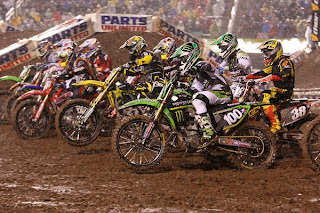 SALT LAKE CITY — The constant, frigid rain Saturday night altered everything from the course to the length of the races at the Monster Energy Supercross races at Rice-Eccles Stadium. It did not, however, change Josh Hansen's strategy. "I just really felt like I wanted to win," said the 26-year-old California native. "I wanted to beat everybody — bad." A self-described "neat-freak" Hansen was a little bothered by the sloppy conditions, but he didn't alter his plan to attack the course if he got the chance. "I didn't want to ride conservative," he said. 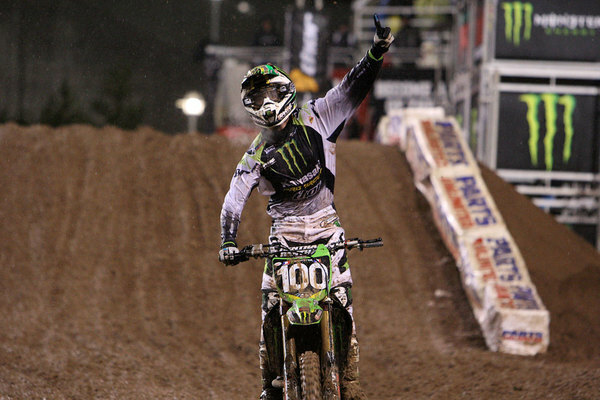 "No matter what the conditions were, I just felt like when you ride like conservative, that's when you make mistakes. I just put my head down and took chances." He just shook his head and smiled when asked why he kept throwing triples when everyone else, including the second-place finisher Trey Canard, Oklahoma, stuck with doubles on slick bumps.